A formation or geological formation is the fundamental unit of lithostratigraphy. A formation consists of a certain amount of rock strata that have a comparable lithology, facies or other similar properties. Formations are not defined by the thickness of their rock strata; therefore the thickness of different formations can vary widely. The concept of formally defined layers or strata is central to the geologic discipline of stratigraphy. 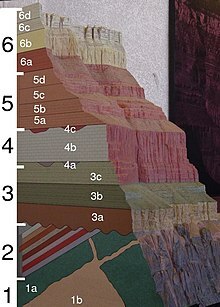 Groups of strata are divided into formations, which are divided into members. The definition and recognition of formations allow geologists to correlate geologic strata across wide distances between outcrops and exposures of rock strata. Formations were at first described as the essential geologic time markers, based on their relative ages and the law of superposition. The divisions of the geological time scale were described and put in chronological order by the geologists and stratigraphers of the 18th and 19th centuries. The lithology of a rock is a description of its readily visible physical characteristics. Modern geology prefers to use lithology, that it an examination of the visible features of the component rocks, to identify discrete formations. Geologic formations are divided into the broad categories of: sedimentary rock layers; metamorphic rocks; and volcanic rocks. Intrusive igneous rocks are generally not considered to be formations. The Permian through Jurassic strata of the Colorado Plateau area of southeastern Utah demonstrate the principles of stratigraphy. These strata make up much of the famous prominent rock formations in widely spaced protected areas such as Capitol Reef National Park and Canyonlands National Park. From top to bottom: Rounded tan domes of the Navajo Sandstone, layered red Kayenta Formation, cliff-forming, vertically jointed, red Wingate Sandstone, slope-forming, purplish Chinle Formation, layered, lighter-red Moenkopi Formation, and white, layered Cutler Formation sandstone. Picture from Glen Canyon National Recreation Area, Utah. The contrast in lithology between formations required to justify their establishment varies with the complexity of the geology of a region. Formations must be able to be delineated at the scale of geologic mapping normally practiced in the region; the thickness of formations may range from less than a meter to several thousand meters. Geologic formations are typically named after the geographic area in which they were first described. Strictly, formations cannot be defined by any criteria other than primary lithology. Nevertheless, it is often useful to define biostratigraphic units on paleontological criteria, chronostratigraphic units on the age of the rocks, and chemostratigraphic units on geochemical criteria. "Formation" is also used informally to describe the odd shapes (forms) that rocks acquire through erosional or depositional processes. Such a formation is abandoned when it is no longer affected by the geologic agent that produced it. Some well-known cave formations include stalactites and stalagmites. Brookfield, Michael E. (2008). Principles of Stratigraphy. John Wiley & Sons. pp. 111–114, 200. ISBN 9780470693223. Rey, Jacques; Simone Galeotti, eds. (2008). Stratigraphy : terminology and practice. Paris, France: Editions OPHRYS. ISBN 9782710809104. Wikimedia Commons has media related to Geologic formations.